“On the evening of September 16, 1949, the "Noronic", a Great Lakes cruise ship carrying 524 passengers, docked at Pier 9, 100 meters east of here. At 1:30 the next morning a passenger noticed smoke seeping from a locked closet. 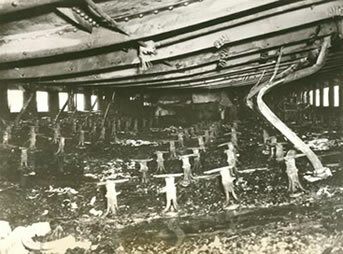 Crew members fought the fire, but it erupted into a life-threatening inferno before they could awaken everyone aboard. Passengers descended the gangway, climbed down ropes, leapt onto the dock, or jumped into the harbour. Firefighters, police and passers-by assisted, but 119 perished. All but one were American passengers. An inquiry resulted in stricter fire safety enforcement which forced older cruise ships out of service and caused a decline in passenger shipping on the lakes”. This is the story of the fate of the SS Noronic, known as the Queen of the Great Lakes. She was built in 1913 for the Northern Navigation Company and made her maiden voyage in 1914. She was a large boat, with a capacity of 600 passengers and 200 crew. Her last voyage began uneventfully on September 14, 1949 in Detroit with 574 passengers and 131 crew aboard. She was en route to Cleveland, Toronto, Prescott, and Thousand Islands. On September 16th she was in the Toronto Harbor at Pier 9. There were very few people on board as they were taking advantage of a night in Toronto. In the wee hours of the morning a small fire was discovered in a linen closet and in no time flat it spread like wildfire through the ship. As the sleeping passengers awoke in the smoke and flames they tried to get out. Some jumped into the harbour. The Toronto Department tried valiantly to save as many people as possible, but tragically 119 lost their lives. The Noronic was totally destroyed. This tragedy had a profound effect on the shipping industry. 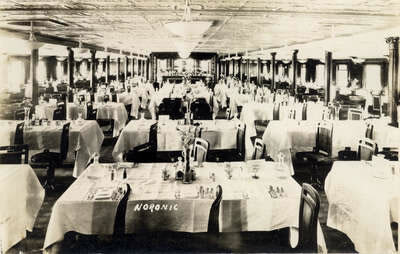 The passenger trade on the Great Lakes virtually ended with the loss of the Noronic. As a result of an inquiry, recommendations were made to improve fire prevention measures, including the need for fire-resistant bulkheads, patrol systems, sprinklers and automatic alarms. Although never proven, arson was suspected. Several months later another vessel caught fire, this time in the St. Lawrence River. The fire had been deliberately set in a linen closet. Justice has never been served. The arsonists were never caught.